How to Boil Eggs - The simple and reliable way. How to boil eggs is part of my learn to cook series. This is the series where I am cooking all of the recipes in my old home economics cookbook from junior high. When you go to the store is may seem very daunting because there are all sorts of eggs. Eggs come in wide variety of color, sizes, and then there are sizes by the different ways they are harvested. When it comes to color of eggs there is really no difference in how they taste. Eggs often come in white and brown eggs, but growing up we even had chickens that laid greenish and blue colored eggs. It doesn’t matter what color the shell is, the egg will taste the same on the inside. Eggs come in a variety of sizes. You will typically find eggs in medium, large, extra large, and jumbo sizes. A medium egg weighs 1.75 ounces, a large egg weighs 2.00, extra large eggs weight 2.25 ounces, and the jumbo eggs weighs in at 2.50 ounces. 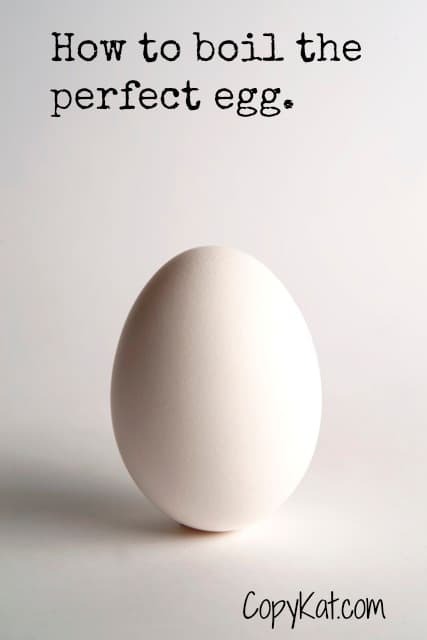 Most recipes are written with large eggs in mind. So when ever baking you may want to make sure that you have the right amount of eggs by weight. Using 3 medium eggs means you will have only 5.25 ounces and if you make it with jumbo eggs you would have 7.5 ounces, and that is a huge difference. So be mindful of the size of the eggs when you buy your eggs. Maybe you have tried boiling an egg by dropping a few eggs in a pot, and then cooking them for a certain amount of time. This method is at best challenging. Stove tops put out a variety of heat, for example your stove my be hotter than mine when I put it on high. We might be using a different size of egg. The easiest method for me is to simply place a few eggs in a pot, cover the eggs with water, and then place the pot on the stove. Bring the water to a boil, and you can put remote the pot from the stove, and placing a lid on the pot then wait for 10 to 11 minutes, and then cool off the eggs rapidly with cool water or by placing the eggs in an ice bath. Once the eggs have cooled you can peel them. After you have peeled your eggs you can put them in potato salads, egg salads, creamed eggs on toast, or just eat them plain. This simple method will keep the yolks from turning green on the inside from over cooking. Drop me a comment down below on your special method for preparing boiled eggs. Learn how to boil the perfect egg. Place the desired amount of eggs in a pot. Cover eggs with water and add about an inch more. Place pot on stove on high. Once the water is boiling for 1 minute, place a lid on the pot. If you are on an electric stove, move pot off of the burner, and onto a cool burner. After 10 - 12 minutes place eggs into an ice bath or run cool water continuously until the eggs cool to room temperature. For perfect eggs to use for Deviled Eggs I found a method that works every time, even with freshly laid farm-fresh eggs: take a thumb tack or hat pin and punch a small hole in the larger end of the egg being careful not to punch in too far — you are trying to not pierce the membrane in this part of the egg. Bring a pot of water to a boil (enough water to cover the eggs) and gently place punched eggs into pot. Boil on low boil for 15 minutes. In the meantime, prepare a bowl of ice water. After 15 minutes is up, take pot from stove and drain hot water. Immediately put the eggs in the bowl of ice water and wait 15-20 minutes then take one egg at a time from the water and peel…..works beautifully every time and the yolk is perfectly cooked with a wonderful yellow color. Before I used this method, I never was able to use our hens freshly laid eggs for anything but frying. Now I can take them right off the nest and boil them right up! Thank you for your brilliant suggestion. Growing up we had chickens and I know how challenging it is to boil fresh hen eggs. I will definitely have to give your special technique a try the next time I get some fresh yard eggs from my Mom. Or you could buy an egg cooker and have perfect no fuss no muss eggs as you busy yourself doing other things in the kitchen. When the buzzer sounds you have perfect eggs. After they’re done ….Don’t forget to put your eggs in a pot with a lid shake the pot vigorously and all the shells come off. Enjoy! Great tip on the egg cooker. My kitchen is too small for any more appliances, they spill into another room 😉 Love the bit about shaking the eggs in the pot. Thank you for your suggestions. Let me add. Do let the eggs “cool” off first and if you’re having a “huge” party after cutting up many heads of lettuce and washing them, shake the pieces in your colander and place in a clean pillow case tossing in the dryer on AIR DRY… If its easy and fast …I’m in! TIP: From the grocery, you can wrap your whole heads of lettuce in tin foil as well as your celery in tin foil place them in the refrigerator and they will keep for weeks, celery for a month. Wow, great tips there. I will have to try this with the celery. I love celery but I don’t use it as quickly as I should. the egg cooker holds 6 eggs very small just put it in a cabinet when not in use…do yourself this favor….you’ll be glad you did! That’s almost exactly how I do it too. Works perfectly! Wendy, great minds think alike! I have never cooked boiled eggs this way but I am going to try it for breakfast this morning. My kids love boiled eggs. I do mine the same way except I let them sit for 20 min. Run under cold water and peel with the back of a spoon. The spoon trick I learned from here. I want to try the spoon trick.